I’m not really a detective. I just use that as an excuse to get out of the house at night. Nick and Norah’s fourth outing, seven years after the first, and incredibly there is little sign of a drop off in quality. If the premise has the air of writers clutching for ideas (the murder of a jockey at a racetrack), the mystery unfolds engagingly, with sufficient diversions and red herrings, including a reporter pal of Nick’s accused of the crime, to more than satisfy. Unlike last time, the murderer is fairly easy to guess through a process of elimination, but as I’ve noted of the other sequels, and no doubt will again, the joy of The Thin Mans isn’t so much the crimes and their solving as the manner in which the Charles react to them. 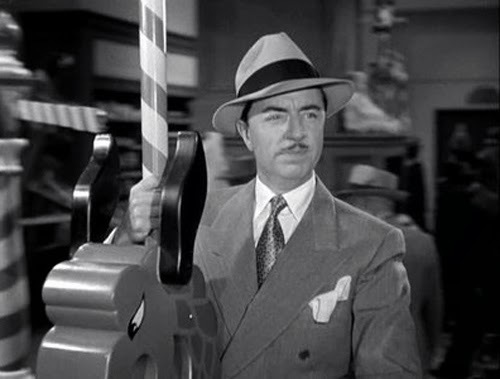 This time Nick Jr (Richard Hall) has become a precocious child, and not the most darling of actors, but William Powell turns nearly every scene opposite him into a comic triumph. And there’s Asta, scared by an ickle kitten. Screenwriting duo Albert Hackett and Frances Goodrich, don’t return this time. Kudos to them for setting the tone for the series, but it has to be said the repartee between Nick and Nora doesn’t obviously suffer under the penmanship of Harry Kurnitz and Irving Brecher. W.S. Van Dyke is back as director, solidly unremarkable, although this would be his final instalment (he died of cancer in 1943). Nora: He’s getting more like his father everyday. Louise: He sure is. This morning he was playing with a corkscrew. 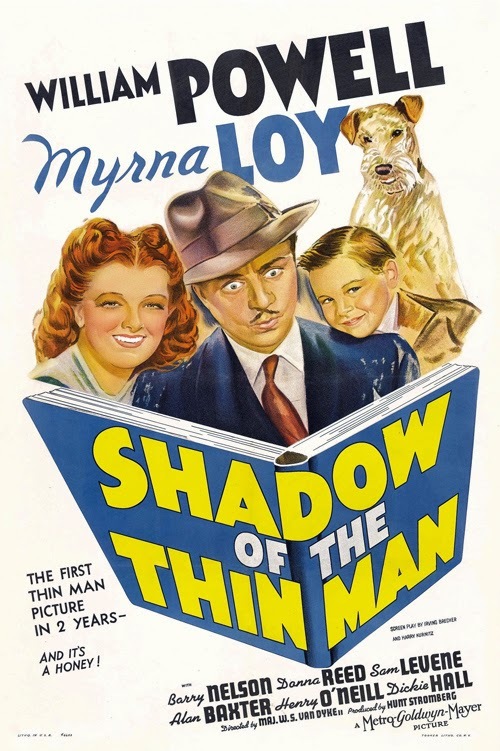 Having been a little surprised by the absence of cutesiness in Another Thin Man, I probably shouldn’t have been fazed that Shadow also fails to succumb. And so it is, we are introduced to Nick reading a children’s story to Nicky Jr. Except that it turns out to be a list of racing tips (“Once upon a time there was a horse. In fact, there were hundreds of horses. 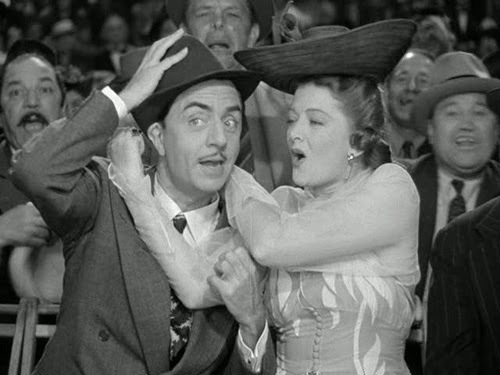 White ones, black ones, brown ones…”) Only the prospect of a drink stirs him from gambling (“Ma’am did he hear that or did he smell it?” asks Louis Beavers’ maid, Stella, as Nick ups and leaves the park across the street when Myrna Loy’s Nora opens a bottle). The beloved child is expertly used to bounce playful barbs between his adoring parents (“Doesn’t daddy ever win at the races?” asks Junior; “Darling, don’t ask questions” replies Mommy). 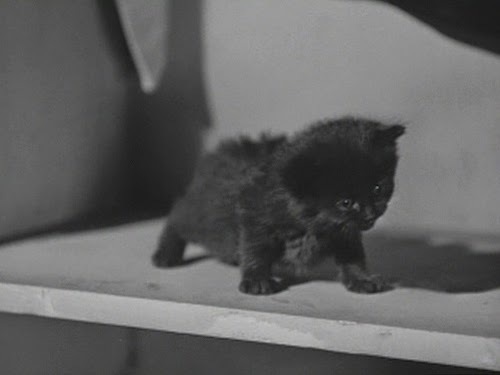 He also insists that a disgusted Nick drinks straight milk (I half expected Nick to use it for a White Russian) and initiates an amusing interlude in which a reluctant Daddy climbs aboard a merry-go-round horse to jeers from the surrounding nippers (“Big man’s a ‘fraidy cat”). The experience is complete with kaleidoscopic Nick point-of-view vision. Nick: Mommy, he’s a great kid, I’m much obliged. Nora: Oh, it was nothing. Any time. Present and correct too are the rascally suggestive exchanges between the two. 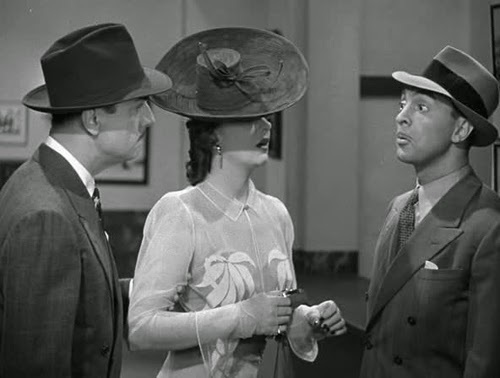 Nick’s Groucho-like double take when Nora suggests she’ll “give him another child” any time is priceless, and Nora is possibly even quicker with the innuendo than he (“Well, that’s the way we check in a the motels” she responds when asked if she is Mrs Charles). 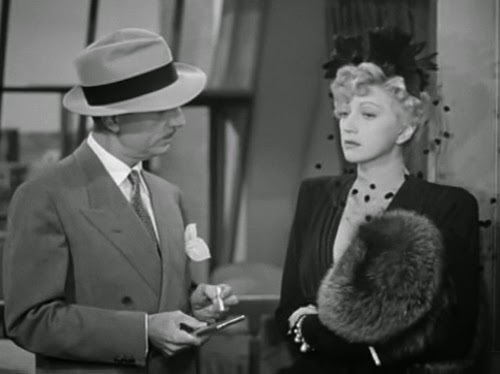 As usual, Nick heads off to solve the mystery leaving Nora to follow him (“Slip into an exciting negligee… and I’ll see you at breakfast”). And if Nick’s skills of deduction are as unparalleled as ever, Nora repeatedly shows she is his equal, either through plain commonsense (admonishing him for driving too fast, just before he gets a ticket), over-enthusing at the wrestling (admittedly, this scene is a little overdone), winning at turtle racing (“Oh barkeeper, bring Mrs Charles 140 martinis. We won’t be long”) or heroically tackling the villain at the climax (“You’re the bravest gal in the world”, Nick tells her). 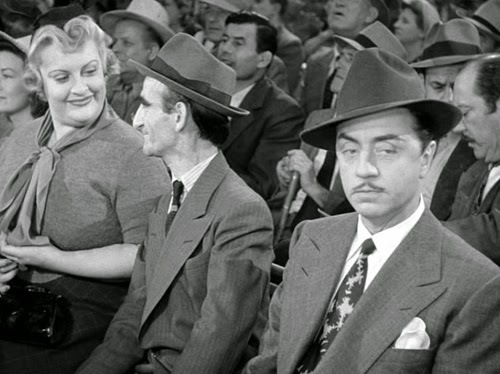 She also has a wonderfully respectful approach to Nick’s dubious associates, addressing one as “Mr” Meatballs. 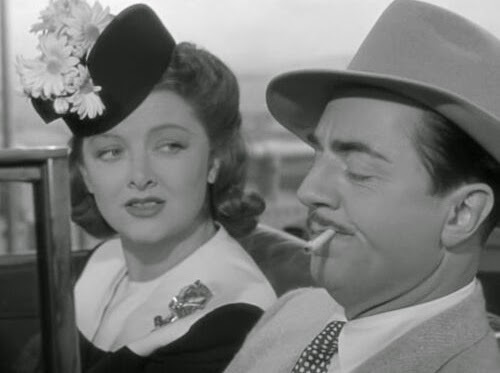 Her hat may be a laughing stock, but she delivers the best line in a movie replete with great ones; Oh, Nicky. I can’t stand it. Was it me? asks Nora as Nick sifts through his customarily assembled murder suspects. Nick’s on top form as he runs rings around the dim police., solving the manner of the jockey’s demise with the kind of piercing insight that would make Jonathan Creek proud. Where this one really scores is with Sam Levene’s Lieutenant Abrams. He was in the previous picture too, but is served a welter of classic lines here. A suspect (Macy) claims in his alibi that he went out for a drive, “no law against that”. “Not if you’ve got a drivers licence”, fires back Abrams. Another suspect keeps referring to him as captain. “Flattery will get you nowhere. I’m a lieutenant…. I’d like to be a captain” reflects Abrams, his mind beginning to daydream. 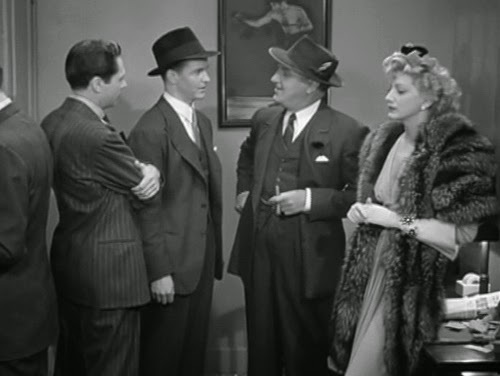 Even one-scene characters are memorable, such as “Spider” Webb, and his explanation of the sentence he served (“I was a victim of circumstances. The DA framed me, not knowing I was guilty. Ain’t that a coincidence?”) Another scene finds a dinner party celebrating the first birthday of a child; the husband has been in prison five years. If suggestiveness is defused somewhat by the news he got out “once”, there’s an implication the line was only there because anything further would have run foul of the censors. 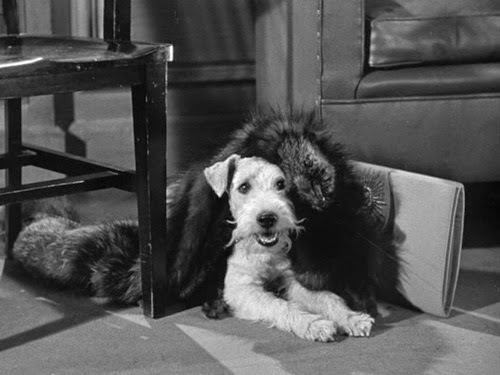 There are also odd little idiosyncrasies, like the landlady whom Nick encounters when he investigates a scene. She’s obsessed with listening to radio thrillers. We hear snippets such as “Dr Fang, your friendly dentist” and “my invisible cape”. Later, there’s an extended bit involving a waiter trying to serve his guests only sea bass, such that any request for broiled lobster is doomed to failure. Asta is irresistible, naturally. He helps Nick locate a gun, finds some jewellery (“Asta, that’s the hottest radiator in town”) and has his own rather peculiar moment when he descends, presumably disorientated, from the aforementioned merry-go-round in slow motion. To balance this out the wonder pooch later gets stuck in some revolving doors, sped up. Of course, Nick is receives the lion’s share of the great lines and, with delivery like Powell’s, he’s a gift to any writer. Promised some great wrestling, he replies, “How’d you know? You went to rehearsal?” When the lieutenant complains the jockey is still worrying him, Nick contributes, “Yes, still dead, huh?” And, in response to moll Claire Porter (the famed Stella Adler), attempting to pass her self off as a cut above, “Don’t look now, but your accent’s showing”. It’s a genuine surprise to see a series remain this consistently good for this long. There are exceptions, but most fluctuate (Rathbone’s Sherlock Holmes for example) or tend to the middling ground (Sanders’ The Saint/The Falcon). 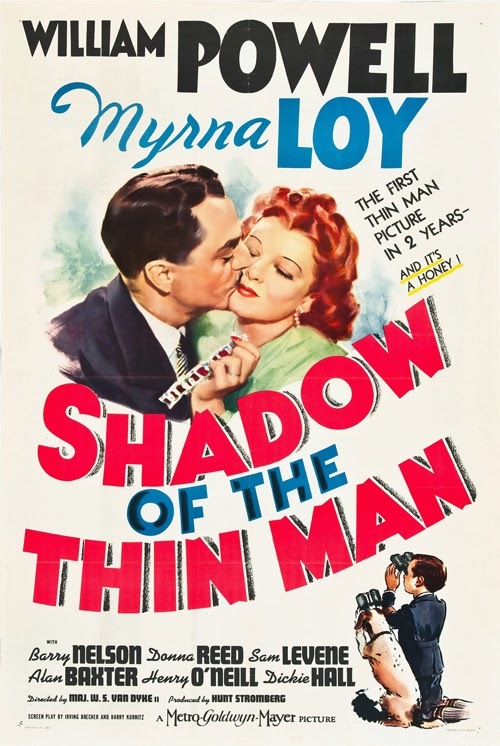 The next Thin Man picture would also be Loy’s next picture, three years later and after volunteering with the Red Cross during the War.